The University of Pretoria (Tuks) Camerata, which celebrated its 50th anniversary in 2018, has received many national and international accolades through the years. The choir falls under the auspices of UP Arts and consists of over 80 full-time students from a variety of study fields, including medicine, engineering, theology, law, education, economics, accounting, plant sciences, music etc. 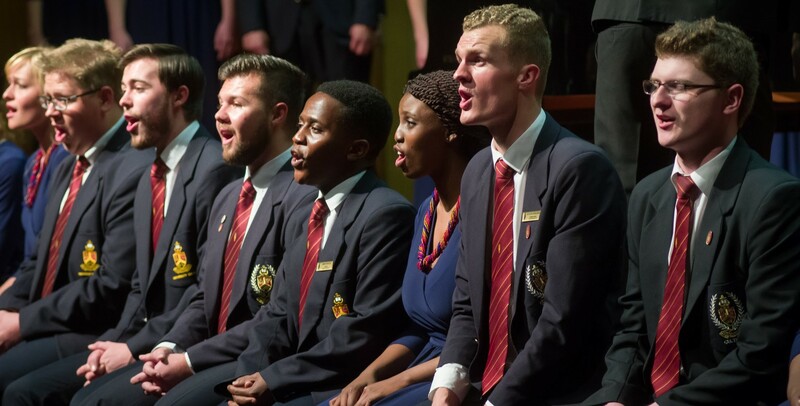 The choir’s mission is to contribute towards the cultural development of the student body, to enrich the broader community by means of choral singing, and to act as cultural ambassadors of the University of Pretoria. In July 2017, the University of Pretoria Camerata was invited to perform at the 11th World Symposium of Choral Music hosted by the International Federation of Choral Music (IFCM), taking place in Barcelona Spain. In July 2014, the Camerata became World Champions at the 8th World Choir Games hosted in Riga, Latvia when winning the Mixed Youth Choir Category with 95.25% and also obtained 2nd place in Scenic Folklore with 95%. The choir also won the prestigious Grand Prix of Nations for Best Mixed Youth Choir in Riga, Latvia that same year. In recent years, the choir has recorded three albums, namely Phoenix (2014), Love and War (2016) and Indodana (2017). Phoenix and Love and War were both received to critical acclaim and nominated in the category Best Classical/Instrumental Album at the South African Music Awards (SAMA). The choir is conducted by Michael Barrett.